The sequel! The fuzzy blue guy is back for another puzzle adventure. In fact, it's Zomp2! The Adventure Continues This game was conceived and created in 1999, soon after the original Zomp. It was completed in just about a month, and released as shareware. It has 8 levels in the shareware version, which has hooked a many puzzle players. It's very challenging compared to the original Zomp. 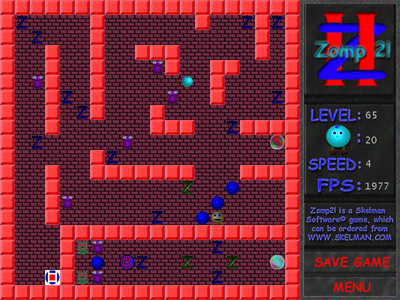 The full version of the game (available to buy) has 70 levels, and a map editor to create and share your own Zomp2 maps. Quite a step up from the original Zomp, the sound, graphics, and gameplay are that much better. An addicting musical techno score (by Jeff Kiecker) is also worth mentioning. Said to be the favorite Skelman Software game of many a fans, Zomp2! is a classic. Released on September 1, 1999. 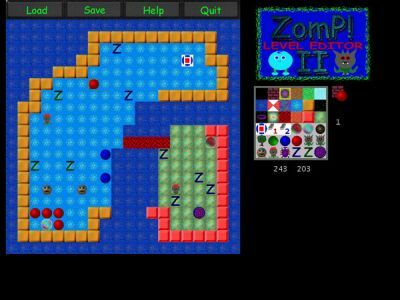 Make your own maps in the Zomp 2 level editor! Give Zomp2! a try. The shareware gets you 8 great challenging levels, and is available on the download page. You can get it here.